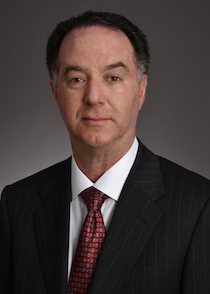 Robert Hoberman joined the firm in 1981, became a partner four years later and now serves as the firm’s managing partner. He has over 30 years of experience in management consulting working with all types of businesses. His expertise ranges from structuring business deals, tax planning, and estate and gift planning, valuations, including the use of trusts. He also has extensive familiarity dealing with banks and financial institutions, as well as tremendous knowledge of data processing, systems analysis, and consulting for commercial applications. A graduate of Syracuse University with a B.S. 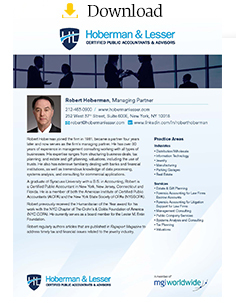 in Accounting, Robert is a Certified Public Accountant in New York, New Jersey, Connecticut and Florida. He is a member of both the American Institute of Certified Public Accountants (AICPA) and the New York State Society of CPAs (NYSSCPA). In 2008, Robert received the Humanitarian of the Year award for his work with the NYC Chapter of The Crohn’s & Colitis Foundation of America (NYC CCFA). He currently serves as a board member for the Lester M. Entin Foundation. Robert regularly authors articles that are published in Rapaport Magazine to address timely tax and financial issues related to the jewelry industry.